All in PDF format unless noted otherwise and open in a new browser window. Some of the Great Grandparents below have their stories on our Great Ancestor Page. (New) and Einarsons branch and Both. If related and you would like a PDF Kinship Report, email me (see above) You will need to include your family line up to one of my four major branches. Avg is 160 pages long. Any Icelandic family would be the decendants of the 1st settlers of Iceland. Very good Research reference for anyone doing Icelandic Genealogical research here. After doing 5,000 scans, a tip; use underscores, not spaces. Keep a consistent nomenclature (naming scheme). Caps or dots work too. More Suggestions from Roy. Pora is a major connection throught the nobles. Pora is Deanne's 24th Great Grandmother. Mark Twain Tree, Sandy thought they were related, yet Roy has not found that connection yet. Jon Sveinbjornsson Oddstad from the Halfdan Helgason website Last name changed to Oddstad, not Oddstead. |Relationship Chart Jon Sveinbjornsson Oddstad to Tefnalchte 87th Great Grandfather. 180 Fan Chart for Andres F Oddstad Jr.
students. 50 - 100 pages, in good to mint condition. 2 staples and a masking tape type of binding. Page 2 gives credits, but no dates. One. One drawing/comment leds Roy to believe it was done in 1967. Many crude drawings and 10 pages , 28 pages of photos with captions. Maps of the old/current settlements and descriptions of them, like Rock Lake. Thanks to Sig & Hank Christopherson, Roy now has a crisp copy of excerpts from "Come into our Heritage". Olafur Thorgeirsson's Almanac which was published from 1895-1954. Has GGF Ravonald in it. University of Iceland, Reykjavík, 1983. Einers Thattr Sokkassenar or Greenlandings Tells the story of Einar Sokkesson of Greenland, one of Erik's descendants still living at Erik's home there. Bodvar Gudmundsson, Where the winds dwell, Turnstone Pr, June 30, 1997, ISBN-13: 978-0888012548. Recommended reading by our relative Sheila Spence, Review, Libraries, Amazon. Einarsson, Magnus. 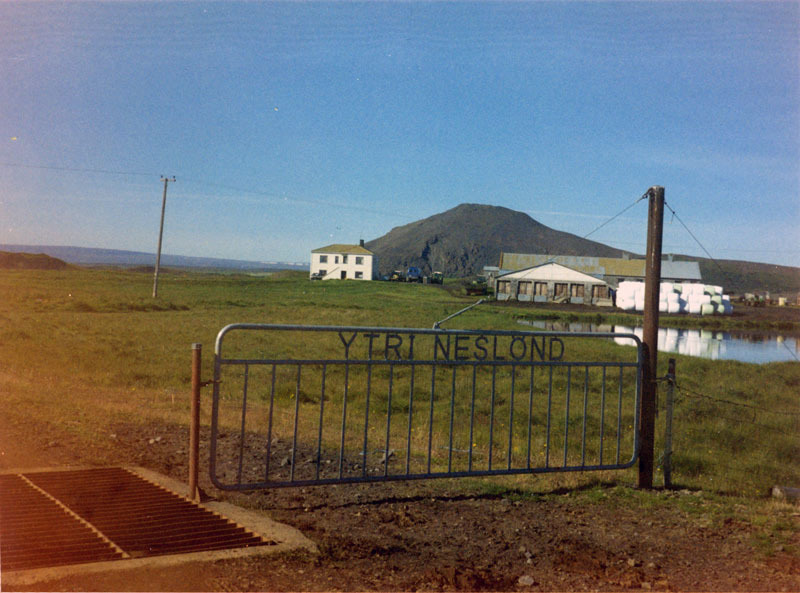 "Oral Tradition and Ethnic Boundaries; 'West' Icelandic Verses and Anecdotes." Canadian Ethnic Studies/Etudes ethniques au Canada 7 (1975): 19-32. Gerrard, Nelson S. Icelandic River Saga. Arborg, Manitoba: Saga Publications, 1985. Gerrard, Nelson S. The Icelandic Heritage+. Arborg, Manitoba: Saga Publications & Research, 1986. Brian Wear-Eylmann was kind enough to obtain a numbered copy from Nelson and ship it down to Roy. Greenway, John L. The Golden Horns: Mythic Imagination and the Nordic Past. Athens: University of Georgia Press, 1977. Hermannsson, Halldor. Islaenderne i Amerika. Dansk-islandsk samfunds smaaskrifter 12. Copenhagen: Host & Son, 1922. Kjartansson, Helgi Skuli. "Emigration from Iceland: The Backdrops to Integration." The Icelandic Presence in Canada: Stories of Integration. Ed. Daisy Neijmann. Toronto: University of Toronto Press, [forthcoming]: 45. Kristjanson, Wilhelm. The Icelandic People in Manitoba: A Manitoba Saga. Winnipeg: Wallingford, 1965; rpt. Winnipeg: R. W. Kristjanson, 1990. Lewis, Bernard. History: Remembered, Recovered, Invented. Princeton: Princeton University Press, 1975. Lindal, Walter J. The Saskatchewan Icelanders: A Strand of the Canadian Fabric. Winnipeg: Columbia, 1955. ----. The Icelanders in Canada. Canada Ethnica 2. Ottawa: National Publishers; Winnipeg: Viking, 1967. Marlatt, Daphne. "Entering In: The Immigrant Imagination." Canadian Literature 100 (1984): 219-223. Neijmann, Daisy L. The Icelandic Voice in Canadian Letters: The Contribution of Icelandic-Canadian Writers to Canadian Literature. Nordic Voices 1. Carleton: Carleton University Press, 1997. Norman, Hans, and Harald Runblom. Translatlantic Connections: Nordic Migration to the New World after 1800. Oslo: Norwegian University Press, 1987. Plumb, J. H. The Death of the Past. London: Macmillan, 1969. Simundsson, Elva. Icelandic Settlers in America. and Scientific Society of Manitoba (1944-1945): 25-43. Thorlakson, P. H. T. "The Shaping of the New Canada." The Icelandic Canadian 19.3 (1961): 15-27. Tomasson, Richard F. Iceland: The First New Society. Minneapolis: University of Minnesota Press, 1980. Pjooraeknisfelag Islendinga i Vesturheimi and Menningarsjpaur, 1940-1953. Recommended reading by cousin Dorothy Christopherson - Tytgat, author Halldór Laxness'. BOOKS BY FAMILY MEMBERS "We are Icelandic - publishing is in our blood"
'The Hearn Family Story' by Mary TELFER Hearn+ , About the Hearn and Taylor Family. Linda Hearn was kind enough to loan Roy a copy which is now digitized for reference. East behind Grund Church, Argyle Dist, MB.